On Ascension Thursday, the Class of 2018 participated in the annual Freshman Retreat in the community center at the Church of the Precious Blood in Monmouth Beach while most of the Class of 2017 took the Advanced Placement (AP) World History test, the first AP exam for Trinity Hall. After the morning exam and retreat, the classes and faculty joined to celebrate mass at Church of the Precious Blood before enjoying the school’s first Field Day back on campus that afternoon. During the retreat, the freshman students talked about “acting justly, loving tenderly, and walking with God,” the theme for this year’s retreat. The students also enjoyed many interactive and calming activities. “My favorite part was the quiet time during the reflection day because I don’t have enough time at home to stop for a second and think to myself and talk to God,” said freshman Julia Henning. 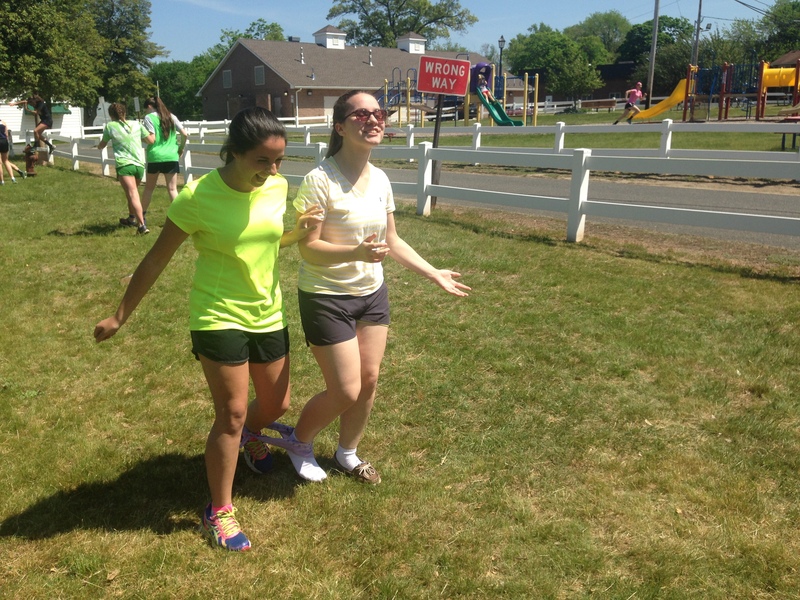 Alessandra S. and Lindsay B. compete in the three-legged race during Field Day on May 14. Photo by Alyssa Morreale. Her classmate Emily Knepple felt similarly. “The reflection day was a good time to talk to God and reflect on myself as a person and how I can improve,” said Knepple. Campus minister Sister Mariann Mahon planned the event to give students a way to build their relationships with God. “I wanted the girls to get closer to themselves and to God,” said Mahon. Back on campus, the sophomores were literally being put to the test as they took the three-hour AP World History test. Despite being nervous about taking their first AP exam, many of the students felt well-prepared and confident after completing the test. “I was very well-prepared for the exam because of the work we completed in World History throughout the year and with all of Dr. [Pamela] Longo’s help. The test wasn’t as difficult as I had expected it to be,” sophomore Abby Marcin said. 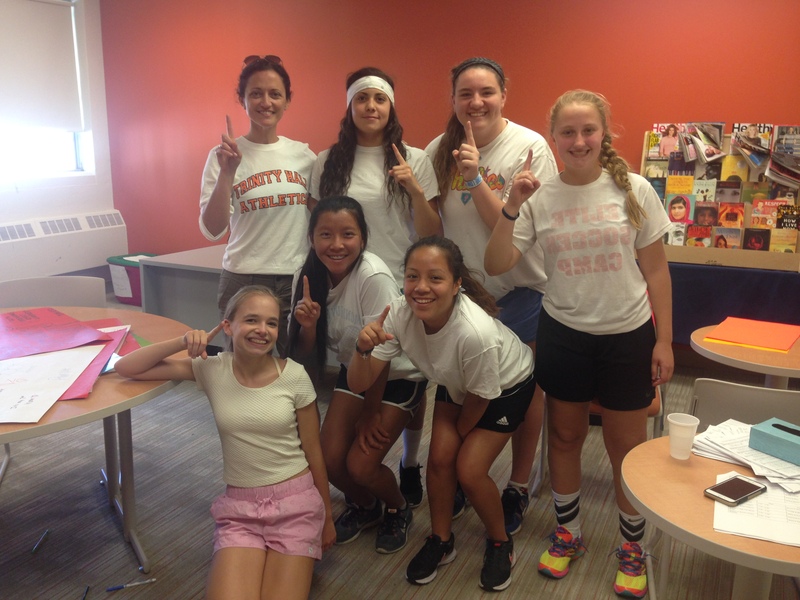 The White Team won the school’s first Field Day competition on May 14. Pictured from L to R, F to B: Lizzy C., Kay F., Liszeth R., Madame Lehman, Malia W., Abby M. and Haley C., Photo by Alyssa Morreale. After the exam, the sophomores ate a quick lunch and boarded a bus to meet up with the freshmen to commemorate the Holy Day of Obligation with a mass at Church of the Precious Blood. Following mass, all of the students and faculty returned to campus for the first annual Field Day, an event created by student body president Pallavi Kawatra and vice-president Marcin. “I had field day at my old school and wanted to bring the successful and fun tradition to Trinity Hall,” said Marcin. Marcin and Kawatra felt that this school-wide event would give students a stress reliever before preparation for final exams began and a chance to work with others as a team, as students were randomly assigned to different teams designated by colors. This year’s victor was the white team who went undefeated in all five events: egg-spoon relay, obstacle course, three-legged race, water balloon relay, and school spirit poster. “I think the Field Day this year was successful but I know that we need to build on it a lot for next year,” said Kawatra.